We’ve had a lot of fun this week compiling our Christmas gift guides and now it’s time for makeup! We’ve picked a few favourites of ours, from budget buys to luxury picks so there’s definitely something for everyone. Whether you’re an eyeshadow lover or a nail polish fan, we’ve got you covered. 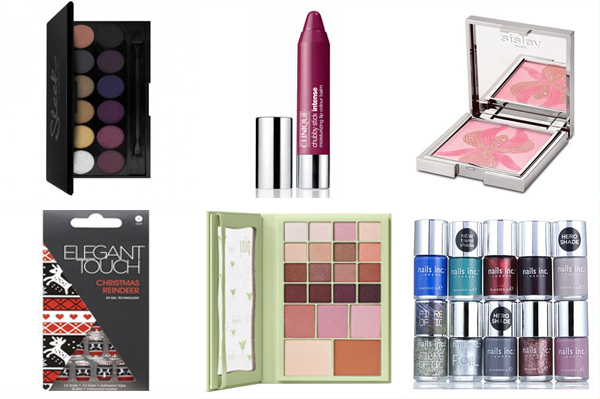 This is one of the best budget palette offerings I’ve seen, perfect for secret Santa! The palette contains 12 highly pigmented shades that are ideal for the winter party season. The shades flatter all skin tones and the palette itself is chic and comes with a little double ended applicator. We love a good fair isle print and if you aren’t too skilled in nail art, these are perfect for sporting christmas themed nails. They aren’t too expensive either so they’d be perfect as a stocking filler. Pixi always come out with amazing, affordable palettes and this one is no exception. A great range of highly pigmented shades including sixteen warm neutral eyeshadows, three blushers, a bronzer and highlighter plus a huge mirror, can’t complain about that! What beauty lover doesn't love a gorgeous compact, and they don’t get more chic than this. What can only be described as one of the most beautiful pressed blushers we have ever seen. This palette creates a festive glow like no other. Pure Christmas decadence through and through. A must have for any nail polish fans. This amazing collection features 10 of Nails Inc’s most loved shades. To buy them all individually would set you back over £100 so it’s an amazing bargain! Has all the favourites from Baker Street to Porchester Square. Our Christmas gift guides are nearly coming to an end, we hope you've been enjoying them so far. We have one last post to finish the series so make sure you tune in tomorrow for some lifestyle picks!